Stringent regulations pertaining to mining owing to its fallout on the environment is a major roadblock for new entrants, wanting to procure raw materials, in the global mica market. This has put well-established manufacturers with integrated operations way ahead of them as they have comparatively easy access to the raw materials. Ashville-Schoonmaker Mica Company, the Premier Mica Company, and the Mica Manufacturing Co. Pvt. Ltd. are to name a few such dominant players. 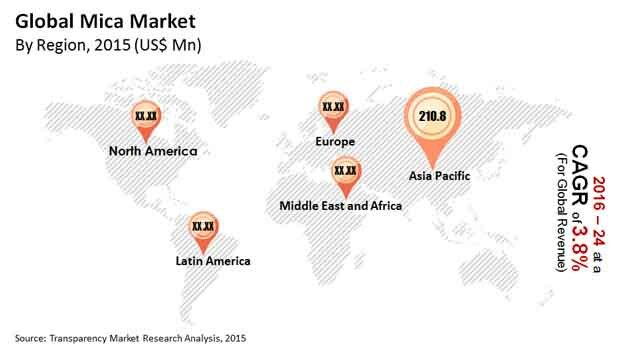 Some of the noticeable trends in the global market for mica are a copious number of raw material suppliers and availability of low priced substitutes such as cellulose acetate, acrylate polymers, fiberglass, nylon, fish paper, and phenolics. These substitutes can supersede mica in filler, insulation, electronics, and electrical usage. Hence, manufacturers of mica have a substantial bargaining power. Another noticeable trend in the market is the steady rise in the price of mica due to the increasing application of mica products. A report by Transparency Market Research forecasts the global mica market to expand at a CAGR of 2.6% from 2016 to 2024, in terms of volume. Vis-à-vis revenue, the market is expected to clock a 3.8% at a CAGR between 2016 and 2024. Based on form, the global mica market can be segmented into natural mica and synthetic mica. Of the two, the natural mica segment occupies a lion’s share in the market on account of its growing applications in different industries. Going forward, however, the synthetic mica segment would supplant its natural counterpart owing to its chemical and thermal properties. This would help it outpace natural mica in terms of revenue growth rate. The report by TMR predicts its revenue of synthetic mica to rise at a 5.3% CAGR from 2016 to 2024. From a geographical standpoint, North America is an established market. It is also a saturated market that offers little opportunities for growth. Asia Pacific, on the other hand, is considered an attractive market as it is relatively underserved so far and has a huge population. In the Middle East and Africa, South Africa, Madagascar, and Sudan are key mica producers. They constitute about 10, 160 tons of total mica production in the world. Majorly boosting the global mica market is the robust building and construction, paints and coatings, and cosmetic industries. “Mica finds application as an additive in paints and coatings industry to improve the product luster. Paints and coatings containing mica stay longer and appear brighter. Mica is used in construction industry for joining cement in gypsum boards, asphaltic roofing, and damp proof seals. In the cosmetic industry mica is used because of the presence of crystalline elements in it,” explains the lead analyst of the TMR report. The electronics industry is also responsible for catalyzing significant growth in the mica industry worldwide. This is on account of excellent insulating properties of mica which is a poor conductor of electricity and heat. On the flip side, strict mandates on mining has proven counterproductive for the mica industry to some extent. Mining can cause serious health issues and people working in mining sites can suffer from chronic and fatal diseases. Governments of different nations have passed rules to arrest pollution resulting from mining. This can pose a threat to the market as there is no other means of procuring raw materials for the mica market worldwide.